When Bella Street and her best friend Felix Samson were whisked unceremoniously across the ocean to Australia, to be hidden in a safe house with two agents posing as their parents, they had no idea of the storm that would follow. The heat and humidity of northern Queensland had them gasping, but the beautiful beaches around their house made up for that. Until the day Bella returned to tell of the black helicopter which had hovered menacingly above her…Was the evil Doc Gutson on Bella and Felix’s trail once again? And was it possible they were being pursued by someone even more evil than the Doc? Would Bella see her mother, Emerald Street again? Their questions all seemed to have no answers…what would happen to them this time?The Fat Lady Sings is the third in the Bella Street Mysteries for young tweens by Aussie author Clare Havens. Sassy Bella and computer literate Felix make a great team while they attempt to defeat the bad guys. A thoroughly enjoyable mystery that I have no hesitation in recommending.With thanks to the author for my copy to read and review. Another great addition to the Bella Street series. Bella and her pal Felix are being hunted by the Doc with the book starting off with them in Witness Protection. Of course, the Doc is able to track them down. There are many unexpected twists and turns throughout this mystery, keeping the reader guessing the entire time. Well written and great flow without being dragged out to make the mystery last longer, like some mysteries do. This book also showed us a peek into the life of Emerald Street, which isn't as it seems! Great read for all ages. In a world of gloomy YA dystopia, it is so great to read an all-out-blast of a story that's clever and positive and fun. Havens delivers a fitting culmination in the final (?) book of the series, leaving the reader wanting to start all over from the beginning and re-experience the madcap, neo-noir world of Bella, Felix, Emerald, and Coco...and Marky Blue-Eyes! (It's special fun for me as my name happens to be the same as the plucky heroine.) Recommended for your kids, grandkids, nieces, nephews, and their schoolfriends. Bella's adventures are not to be missed! That dastardly Doc Gutson is up to her old tricks! Clare Havens - Growing up under the wide East Anglian skies, made famous by artist John Constable, and a love of Agatha Christie, Margery Allingham and DL Sayers, inspired Clare to write her 'Constable Country Mysteries'. The first in the series, 'Writer's Block', about the untimely death of muck raking social climber Daniel Flynn, was published in May 2014. 'Still Waters' was the second in the series and 'Tailor Made' rounds out the trilogy.Likewise, living in Manhattan and loving the black and white movies starring William Powell (The Thin Man) and Humphrey Bogart (The Maltese Falcon and many others) inspired Clare to write her middle grade fiction Tween noir books, 'The Bella Street Mysteries'. The first two titles, The Secret Formula' and 'Doc Gutson's Revenge' were both been runners up in the Sydney Local Writer's Word Festival. 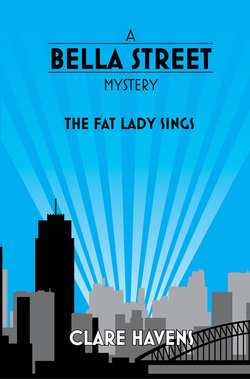 The third book in the series, 'The Fat Lady Sings' has just been published on and new editions of all three books are now available as 'The Bella Street Mysteries Trilogy'! 'The Bellamy Bird', a mystery for young and old alike, set in the 1930s at a grand English country manor. A very British mystery for fans of Agatha Christie, PG Wodehouse, Richmal Crompton and Arthur Ransome.